*After we’d devoured this I regretted that I hadn’t added capers. So if you’re inclined, I think they’d be a great addition! – Wash potatoes and cut into quarters. Spread evenly on baking sheet and sprinkle with sea salt and fresh cracked pepper. – Place in oven and roast for 15 minutes. Turn potatoes to prevent burning and roast for 15 additional minutes or until crispy. – Place chickpeas on a baking sheet and sprinkle evenly with sea salt, paprika and coconut oil. Shake pan and roll chickpeas around to coat them all evenly. Place in oven with potatoes to roast alongside for the last 15 minutes. 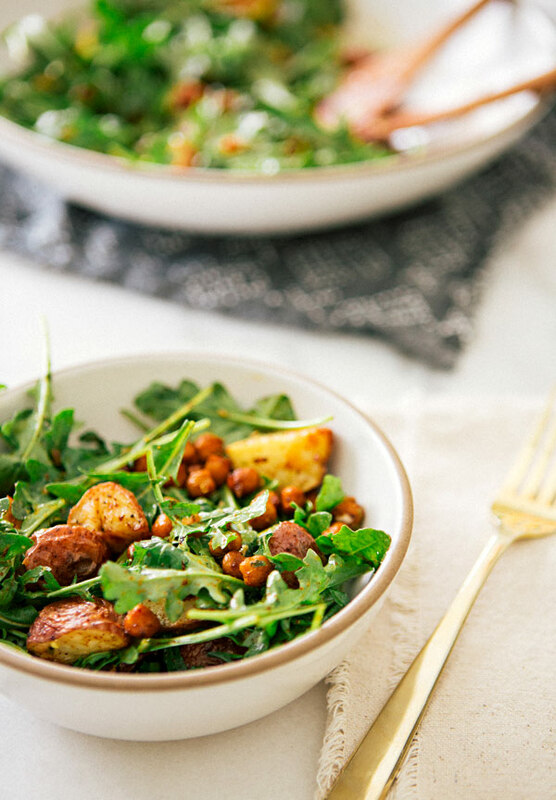 – While potatoes/chickpeas are roasting prepare dressing by combining shallot, lemon juice, garlic, mint, white wine vinegar and olive oil. Mix well. 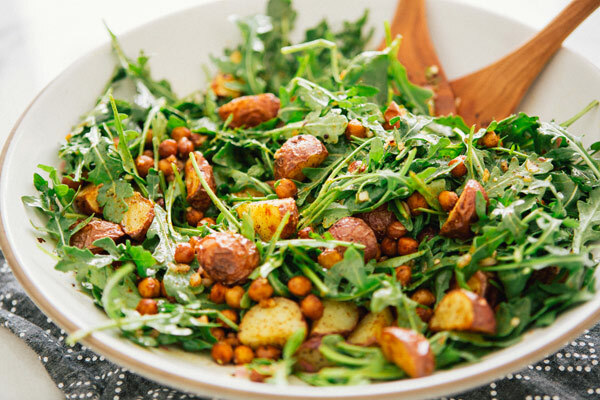 – Combine arugula, potatoes, chickpeas in a large serving bowand dress to your preference. Give it a few tosses, add finishing salt to taste and serve warm! Oh my, I can't wait to make this! 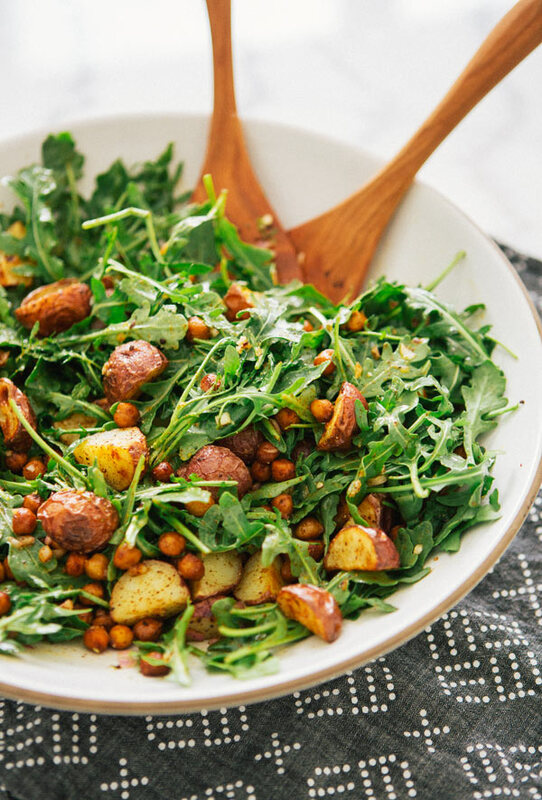 Roasted potatoes is definitely one of my favorite salad toppers! This combo looks delicious! Yum I Love rocket and this just looks delicious. I must give it a go! great pictures too. I imagine the mint is really what makes this one a keeper! Love your blog, thanks for the recipe! 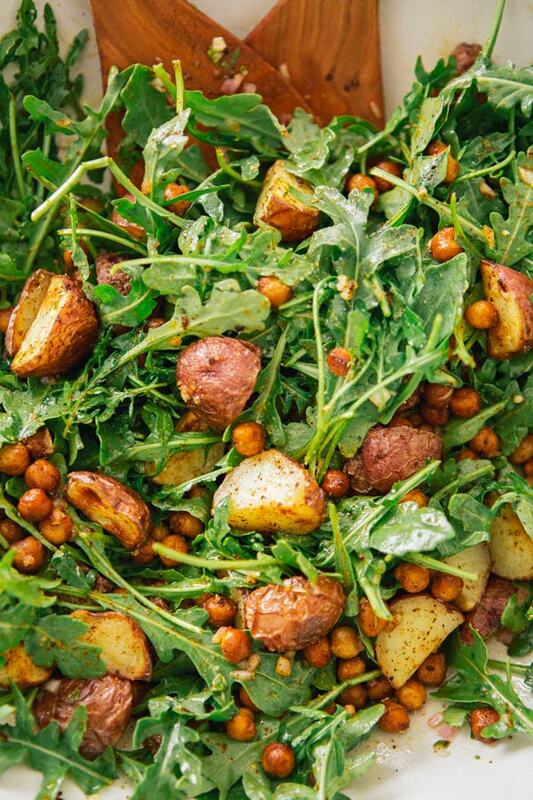 I love roasted potatoes in a salad! This looks delicious and easy! Lovely recipe! Can't wait to give it a whirl! Looks so delicious. I've been growing potatoes and trying to come up with fun ways to cook with them. 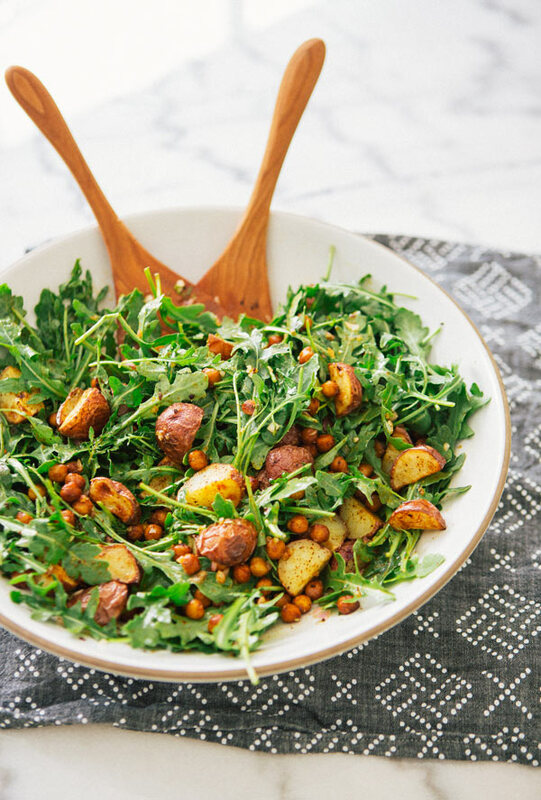 This salad is officially on the list! Looks lovely! Your choice of recipes is outstanding. This salad look delicious. Already pinned the recipe. PS – I love your gray napkin, hand towel too. So cute! This looks delicious. Yum. I might even add some chicken to it 🙂 Thanks for the inspiration. Ive just starting to eat more healthy which includes planning and cooking. I can hardly wait I to try this. Thanks! I made this for dinner tonight and it was delicious. Great combo of flavours. Thanks for sharing. This salad is delicious! Thank you so much for sharing it, Sarah. This was absolutely delicious. Thank you for sharing! This was scrumptious! What a great combo of flavors. We used a little bit of cilantro and basil rather than mint (daughter doesn’t like mint in savory dishes:). We tried capers on one bite – didn’t need it and was better without. Tried olives on one bite – didn’t need it and was better without! Thank you! Are the chickpeas supposed to be crispy?